There’s more to urban exploration than hidden alleys and abandoned buildings. Dive behind-the-scenes with these six daring photographers as they seek out and shoot the secret corners of major cities. “Urbex” is an abbreviation of “urban exploration,” the practice of exploring the undiscovered areas o f metropolises around the world. Within the urbex community, there are several niches. There are those who seek out abandoned houses and industrial structures, those who prefer systems of underground tunnels, and those who climb rooftops for an unexpected city view. They are all united by a shared passion for the unknown, and they almost always bring their cameras. To give you a sense of the scope of this particular trend, Instagram hosts over five million photographs tagged #urbex. While viewers recognize urban explorers for their daring feats, this kind of photography is about more than the adrenaline rush. Great urbex photography carries a message about our history and its preservation. When others turn their lenses to the “next big thing,” a few courageous individuals seek out the forgotten, the invisible, the derelict, or the overlooked. Without some of these artists, records of certain areas simply wouldn’t exist. 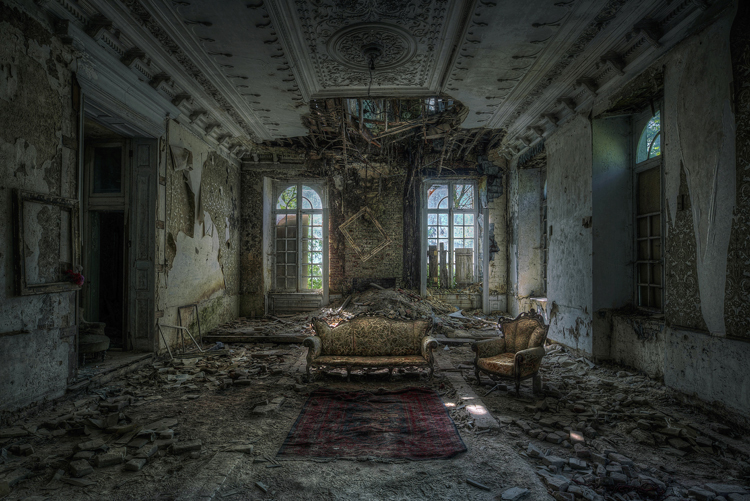 In that sense, urbex is a kind of visual love letter to our cities and a reminder of our past. For that reason, we asked six urbex photographers of all sorts to give us a behind-the-scenes look at some of their adventures. Time and again, they stressed the importance of safety, and they also explained the rules associated with the urbex community. If we are to preserve these places, we must respect them, so throughout this article, you’ll also find variations on the popular urbex saying, “Take nothing but photographs; leave nothing but footprints.” So, read on to learn more. Image by Cristian Lipovan. Gear: Canon 5D Mark III camera, Canon 16-35mm f/2.8 lens. Settings: Focal length 16mm; f10; ISO 100 (this frame is made of 5 exposures: -6, -3, 0, +3, +6). This photo is one of my favorites. The first time I found this place on the Internet, I knew I wanted to explore it. I made a big effort to get there, and I had great expectations. This is a mansion on the outskirts of Paris in a wealthy neighborhood. Getting inside was an adventure. I had to climb a two-meter wall, walk through the yard to the building, and then climb the facade to the balcony, where I managed to get inside. I find locations from my travels and explorations all over the world, and I also find some during my many hours on the Internet, where I look for all sorts of clues and information. Additionally, I have a few virtual friends, and we share locations with one another because we trust each other not to destroy or take anything from those locations. In most places, I can get in without asking for someone else’s approval, but it’s very important to remember the saying, “Leave nothing but footprints, take nothing but photos!” I always respect this rule, without exception. Be appropriately equipped, and always be careful when shooting in places that are in serious degradation because most are in the process of collapsing. Many of the places I photograph are pretty risky, so I’m very careful about where I’m going. I like adventure, but I always stay within certain limits. Image by Benjamin Beech. Gear: Canon 5D Mark III camera, 28mm lens. Settings: Exposure 1/90 sec; f8; ISO 400. I am interested in abandoned places, or haikyo in Japanese (I live in Japan). It has been my hobby to explore and photograph abandoned places for the past five years, mainly in Japan but occasionally in other countries too. This is an abandoned Iron Smelting Factory in rural Japan. It was first built in the 1880s, and it was used for over a hundred years before finally closing its doors in the year 2000. It has sat abandoned and unused ever since. I visited this place two years ago on a cold, wet late-autumn day as a storm was moving into the region. The imminent storm with the moody skies overhead and the deep red autumnal colors created an amazing atmosphere, which made for some great photographing. Inside the building were rooms of belongings and work offices untouched for almost two decades. This has to be one of my favorite explorations to date. Plan your trips well. Make sure you know exactly where you’re going and how safe the location is. Be well prepared with face masks, torches, tripods, and a smartphone. Always go with a friend, or, at the very least, let somebody know where you are going. A lot of these places are extremely old and dangerous; accidents can and do happen. Covering all of the above steps should be standard practice. I tend to find the locations I visit through online research, and occasionally by accident when I’m out exploring another place. There’s an unwritten rule in the haikyo world that locations cannot be shared online, so if you really want to visit a particular place, you need to look for clues online as to where the location is. You might also spend hours looking at sites like Google Maps to pinpoint its exact location. Once you have found the location and successfully photographed it, go ahead and share the images, but don’t post the location details online! One other unwritten rule that people within the haikyo community take very seriously is “Take nothing but photos, leave nothing but footprints.” I can’t stress enough how important this is. All too often, these locations are ruined by people who don’t respect these rules and either take items from inside the locations or leave their mark there by either vandalizing or damaging the area. Image by Marianna Ianovska. Gear: Nikon D7200 camera, Sigma 8-16mm f/4-5.6 lens. Settings: Focal length 8mm; exposure 15 sec; f18.0; ISO 100. Cities are not only about streets, cafes, and houses. So many interesting things are hidden from the eyes of ordinary passersby. My urbex work includes pictures shot from both high-rise roofs and underground mines. I made this particular shot this winter in Panama, where there are no observation decks at all. I found a roof, but the door was locked. So, I had to climb through a window in the engine room, and from there, I climbed two more floors on a ladder to get to the very top of the roof. I spent several hours standing on a dangerous parapet to make this photo. Look up to find higher ground. Or look down to find small, hidden doors that lead to historic catacombs. When you pass by buildings that seem abandoned, look carefully, and perhaps you’ll find something unique. Shooting from towers and roofs is not always safe. Be careful, and do not approach the edges of tall buildings. Test out the reliability of any stairs before climbing, and refrain from shooting in windy weather. And keep in mind that entering some of these places might be prohibited. In many countries, however, you can negotiate with the guard or the owner of the building. Image by Marianna Ianovska. Gear: Nikon D3100 camera, Sigma 10-20 mm f/4-5.6 lens. Settings: Exposure 30 sec; f8.0; ISO 200. As for shooting underground, remember that tunnels and mines are often old and delicate. 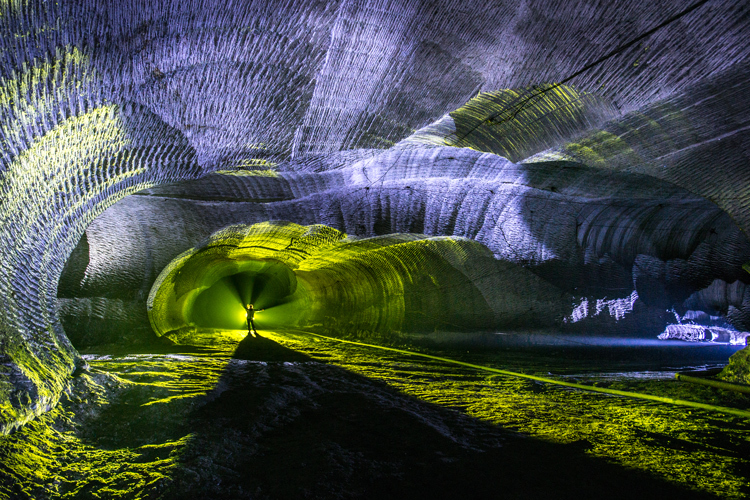 I took the image above in a gypsum mine in the Donetsk region of Ukraine. Watch your step, and be careful. Take a good lantern, comfortable shoes, and gloves. When I’m shooting in underground mines, I use an amateur Nikon 3100 and 5100 camera. Taking expensive devices underground always poses a risk due to their bulky size and the damp and dusty conditions. Different lighting sources are also an important part of my kit since there is no light underground! Any powerful LED lamps will work, along with filters and lenses of different colors. Additional light sources can include carbide lamps, gas lamps, and candles. Image by Sherman Cahal. Gear: Nikon D810 camera, Nikon 14-24mm f/2.8 lens. Settings: Focal length 14mm; exposures 1.3s, 2.5s, 5s, 10s, 20s sec (5 merged shots); f13; ISO 64. I have traveled the Middle West and Appalachia, photographing residential, industrial, and commercial buildings that exist in various states of disrepair and decay, creating a visual record that invokes the peculiar appeal of old and worn. This is one of my favorite photos. It comes from St. Joseph’s Church in Albany, New York, an example of stunning Gothic Revival architecture with an interior that is immaculate, even after over twenty years of closure. Church bell towers are always difficult to photograph, partly because of their tight quarters and partly because of neglect. You have to deal with shaky stairs and ladders, a massive amount of hazardous bird dung, poor air quality, and nearly impossible vantage points for shooting. These church bells were not as difficult to access as others, owing to fairly routine maintenance of the stairs and the tower by the church and then by the city. It’s now easier than ever to use topographic maps and cross-reference them with aerials to locate structures. For instance, many abandoned industrial areas are located along railroad tracks, so I spend many hours tracing active and abandoned lines, where I have discovered anything from mammoth power plants to coal and limestone mines. Timing can be everything. There are many places that I would have loved to visit but came upon just a bit too late; by the time I arrived, they were either demolished or under renovation. Most of the time, the only safety gear that I bring along is a full MSA face mask with a combination cartridge to protect my lungs from particulate and gaseous contaminants. Many of these old hospitals and industrial sites are riddled with asbestos, mold, and bird droppings, all of which can present health obstacles either in the short term or long term. I am thankful that I have not had serious injuries other than pulled muscles from carrying around my camera backpack! Image by R. Wellen Photography. Gear: Canon 6D camera, 17-40mm L series lens. Settings: Unknown. This is an old factory in the Southeast. These large machines were just left there to sit and rot. They have this cool steampunk feel to them, and I hope someday at least one of them gets put into a museum for industry. Safety comes first. These places are often located on the outskirts of nowhere. Always be aware of your surroundings. Never park your car on the property you intend to explore if it can be avoided. If you run into the police, I believe your vehicle can be impounded if it’s on the property with you. If you have to park on the property, try to obscure your car as best you can. Bring a heavy-duty flashlight, one of the large metal ones you often see security guards using. It gives good light and can also act as a weapon if you run into serious trouble. Assuming we are talking about real exploring and not a tourist attraction that looks abandoned, an explorer is entering a sort of no man’s land. There’s no telling who or what may be inside. It’s always better to go with others, as empty buildings make all sorts of weird noises. If you go it alone, remember to keep breathing. Keep your head on a swivel, and don’t ever get too comfortable. Pants are better than shorts, but keep in mind these places have no temperature controls, so they get hotter in summer and colder in winter than the outside temperature might suggest. Gloves are good but not necessary. Bring shoes you don’t mind getting dirty. And always bring a tripod. Be prepared to navigate thick vegetation. If you’re in snake country, try to sweep the grass in front of you. In terms of finding places, don’t ask others. It’s considered bad form to ask and to tell. Sound impossible? It’s definitely getting harder. Here’s where you can find some information: If you see a video of an explorer on YouTube, there’s usually someone in the comments spilling the beans on the location. Also, keep an eye out for any street signs or recognizable landmarks. Even an old sign can be enough for Google. Use Google Maps, and follow the train tracks. Most small towns got their start supporting some sort of industry that eventually got shipped overseas. The buildings they operated out of got left behind. It can take a while, and it can be frustrating, but the research is half the game. Driving is also key. Pick an obscure town on the map, and take any back roads you can find to get there. It’s a good way to find abandoned houses. Stay off major freeways; you won’t find much of anything there, other than maybe an abandoned restaurant. Access is different for every spot. Personally, I only go after the ones that don’t require superhuman physical feats. But I’m old. If you don’t mind climbing a fence, then you’ll find more opportunities. If you can, drive around a property. There’s almost always a better way in than the first one you see. Sometimes it isn’t obvious. I’ve had to walk back through the woods behind a location or down train tracks to find a hole in a fence. Finally, it’s been said a million times but always rings true. Take nothing but pictures, and leave nothing but footprints. Image by Maurizio Sartoretto. Gear: Canon EOS-1DX Mark II camera, Canon EF 16-35 mm / 2.8L III USM lens. Settings: Focal length 18mm; exposure 1/125 sec; f11; ISO 100. 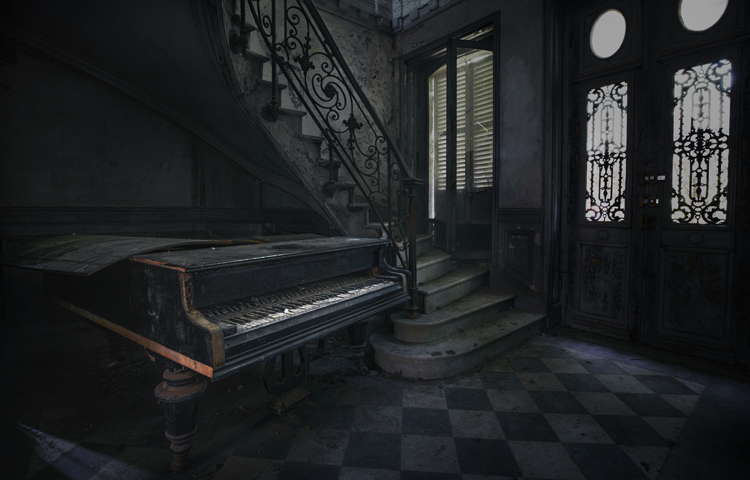 Urbex is about rediscovering forgotten places. Photography and documentation are essential elements of this activity. This sugar mill has been abandoned since 2001. It is one of the many examples of industrial archeology in Italy. Read up on the spot first, especially in cases of industrial archeology sites. It is better to know which products the place used to avoid unpleasant surprises. There is always the risk of running into potentially toxic processing residues. In crumbling buildings, look where you put your feet, and watch what’s above your head. Carefully evaluate any stairs. It’s better to avoid wooden ones if the humidity is significant. Do not park your car near the places you explore. Inside, stay away from windows and openings so as not to be noticed from the outside. Beware of possible unwelcome guests. When in doubt, do not enter or follow unsafe passages. Top Image by Marianna Ianovska.